Maya Portner in Saint-Louis, Senegal, where she attended an artist residency from January to March 2015. Maya Lea Portner is being honored by the Honolulu Museum of Art as the 13th recipient of the Catharine E.B. Cox Award for Excellence in Visual Arts. Portner’s work is inspired by the abstraction of mapped land. 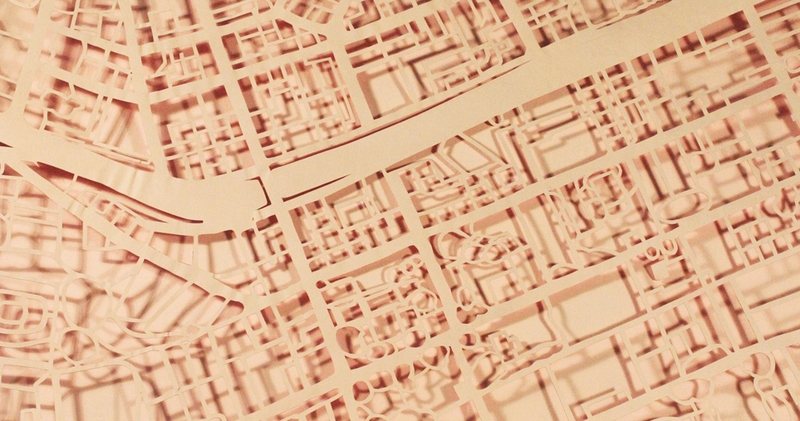 For her exhibition titled Urbanophilia/Urbanophobia—Love and Fear of the City, she will create a sculptural installation based on aerial photographs of selected zip codes in Honolulu. Artist statement: My work for the exhibition will consist of images and objects created from acrylic paint-coated paper. I am experimenting with the potential of this paper by folding, cutting, and sewing. I am consistently inspired by the abstraction of mapped land: urban, suburban, rural, agricultural. For this work I am studying aerial photographs of Honolulu taken from Google Earth, and carefully cutting an abstracted pattern into the paper, based on the shapes of buildings, trees, streets, freeways, plots of land, hills and mountains which have been recorded from an aerial view. Especially interesting to me is the constant flipping of perspective from aerial view (the satellite image) to an eye-level view. Using the satellite information, I imagine the ground-level perspective of urban Honolulu. While my interpretation of the aerial view does not convey information that is useful in the traditional sense of mapping, my desire is to create an image/object that emphasizes the map’s abstract nature through a subjective, personal contemplation of my home city. Artist bio: Maya Lea Portner grew up in Honolulu, Hawaiʻi. She earned a Bachelor of Fine Arts in Sculpture from Washington University School of Art in St. Louis, Missouri and a Master of Fine Arts in Art at the University of Hawaiʻi at Mānoa, where she studied in the fiber program under the direction of Pat Hickman. Portner actively exhibits her work in Honolulu and has exhibited nationally in St. Louis, Missouri, and Brooklyn, New York; as well as internationally at the Museum of Natural History ‘La Specola’ in Florence, Italy, and in the Holland Paper Biennial in Den Haag, The Netherlands. In 2011 Portner traveled to Gujurat, India, as Artist-in-Residence at CHHAAP Baroda Printmaking Studio, and in early 2015 was an artist-in-residence at the Waaw Artists’ Residence Center for Art and Design in Saint-Louis, Senegal. Portner lives in Honolulu and lectures in Art at the University of Hawaiʻi at Mānoa and Hawaii Pacific University. Learn more about Urbanophilia/Urbanophobia at this intimate talk with the artist. Watch a discussion of Urbanophilia/Urbanophobia featuring Maya Lea Portner and curator of contemporary art James Jensen. The Catharine E.B. Cox Award for Excellence in the Visual Arts was established in 1985 by Cox’s grandsons Charles S. Cox of La Jolla, California, and Doak C. Cox and Richard H. Cox of Honolulu. A former teacher, Cox helped Academy founder Anna Rice Cooke research and catalogue her collection and went on to serve as the Academy’s first director, from 1927 to 1928, overseeing the preparation and opening of the institution in 1927. She continued her distinguished association with the Academy as a member of the board of trustees until 1934, acting as the board’s secretary. She died in 1964. The Catharine E.B. Cox Award is given biennially to former or current Hawai’i residents and grants the recipient a one-person exhibition at the museum. They are selected on the basis of their demonstrated talent and promise, with first consideration given to emerging visual artists working in any media.